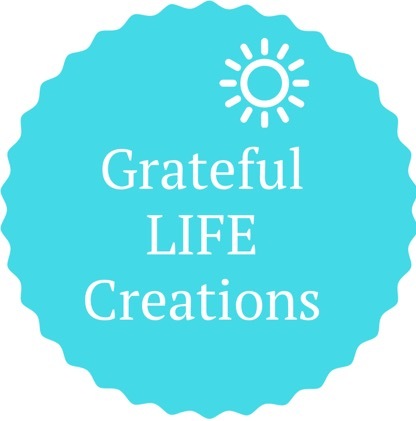 Grateful LIFE Creations – Inspirational items that uplift and encourage YOU! Welcome to Grateful LIFE Creations. These pillows are handmade with love to remind you that there is hope in an unstable world. Beautifully embellished with scripture or a word of inspiration, these creations of positivity are sure to brighten your day. Click the menu to purchase products on Amazon, Etsy and Zazzle. 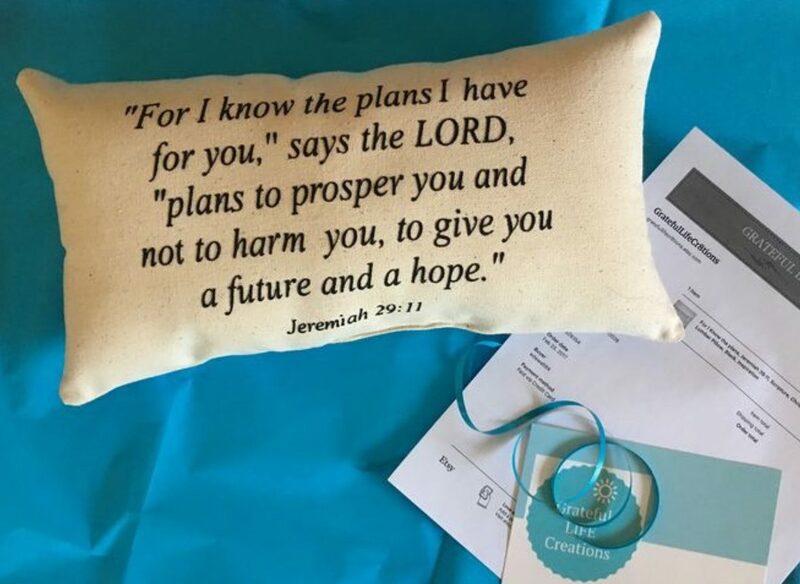 NOW SELLING INSPIRATIONAL TOTE BAGS and T-SHIRTS ON AMAZON at GRATEFUL LIFE CREATIONS T-SHIRTS!!!! Making a difference in 2019. You buy a pillow ☀️ we donate 4 meals to the Children’s Hunger Fund. I used to volunteer at a local food pantry. I got busy building my business and missed helping families at the pantry. This is my way to continue giving back. Giving meals to children helps their health, mindset, and can help break the cycle of poverty. Janine’s BOOK – Sis, You Are Amazing! Sis, You are Amazing is Janine Faulkner’s first published book. This book is a 30-day journal of upliftment, inspiration and encouragement written to spur women to greatness. Each day represents one of 30 of her handmade pillows to inspire and encourage women to be their best and to live life to the fullest. Click Here… Continue reading Janine’s BOOK – Sis, You Are Amazing! Perfect addition to my prayer closet! It is still a work in progress but my “Trust God…Period” is perfect! Thanks for the free gift. Great Seller! Fast Shipping and item as described! Highly Recommended! I love my pillow! I received it sooner than the delivery date and the packaging was beautiful. I felt like I was opening a special, beautiful gift…which I was. The handwritten note…made me so happy. I can tell love and care were put into this purchase. I will definitely buy again. Bought as a gift for a friend & she loved it! By Amazon Customer on April 10. 2018. By Amazon Customer on January 7, 2018. Well made pillow, smaller than expected but I could have overlooked the Dimensions. Overall nice addition to my decor. By Amazon Customer on November 7, 2017. By Amazon Customer Carolyn h. on September 20, 2017. I thought it would be bigger but it’s still cute. By Amazon Customer on August 10, 2017.
always helpful. cares about customer. a joy to do business with! By Amazon Customer on April 28, 2017. 5.0 out of 5 stars Constant Inspiration, hope, and peace. I love these simple but beautiful pillows. Their simplicity fits into any decor, but the real beauty is the inspiration. I almost died once this year with a total bleeding and given only 20 minutes to live. I told God I was surrendered to His will and the peace I felt, knowing I was dying is beyond words and it has stayed with me. I do not want to die but I am not afraid to die. If you are struggling with adversity and fearful, feeling powerless or unloved, I highly recommend this or any of the other pillows highly. The bleed out left me with some temporary short term memory loss, and when I forget God’s promise, and my day is just not peaceful, I look at my pillow and my soul and spirit immediately are inspired and lifted. God Bless . I highly recommend this product. I just opened my new pillow and it is perfect! My order arrived in a timely manner and it was even wrapped in pretty tissue paper. I have a friend that I see every week whose husband has terminal cancer. I will keep this in the trunk of my car and give it to her when she’s had a particularly bad night. This is a beautiful service that you are providing. I plan to buy more pillows to uplift others as different situations arise. Thanks so much for making it so easy for me to inspire my dear friends. I’m not sure when the pillow arrived because I had not checked my mail in a few days, but I know that it came in a very timely manner. The process was very easy. Will get back to you soon. I love it! It is very unique and chic. Be aware this is a pillow sham and you must provide a pillow. Thankfully I had one that fits perfectly that completes the look. Well made and exactly what I expected. The wrong pillow was shipped originally but the shipper corrected it immediately at her expense. Things happen and she handled it with excellent customer service. By Amazon Customer on January 2, 2017. By Amber on December 8, 2016. By Josh on May 20, 2016. By Dan on May 6, 2016.